Xiaomi’s Redmi 5A last year was a revelation in the entry-level segment. 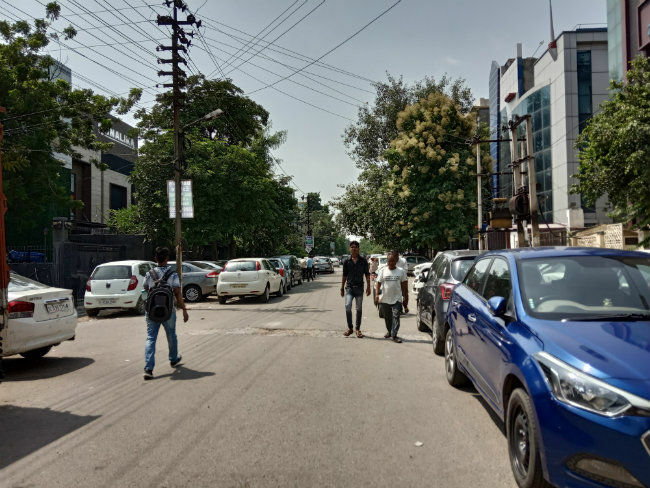 According to the company, it sold around 5 million units of the smartphone till March 2018. It’s September and surely the company must have sold a lot more. Naturally, the successor to a device as popular as that will carry high expectations. 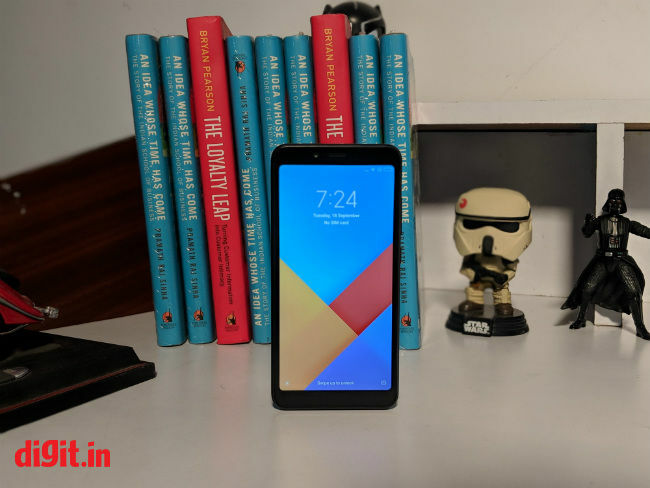 The Xiaomi Redmi 6A aims to take over the baton as the phone to get if you’re upgrading from a feature phone, and it brings bearing features from more expensive phones. But did Xiaomi get it right the second time? Let’s find out. The Xiaomi Redmi 6A incorporates a design similar to more expensive Redmi Note 5 Pro and the Redmi Y2 - A metal body design, taller display and the likes. It’s comfortably compact with a 5.45-inch display fitted into a 5.8-inch body. It’s slightly bigger than the Redmi 5A but offers more screen real estate than last time. The design with rounded edges isn’t going to turn heads, but it’s perfectly functional. Tapping on the back of the phone indicates that the metal casing on the phone isn’t as hard, but it will be resistant to scratches. It’s also quite resistant to fingerprints and smudges. A single camera unit is aligned horizontally in the top left corner and the way the flash unit is positioned, it’s easy to mistake it as a dual camera unit. Furthermore, the speakers are placed at the back and sound gets muffled if you’re watching something holding the phone in the landscape format. 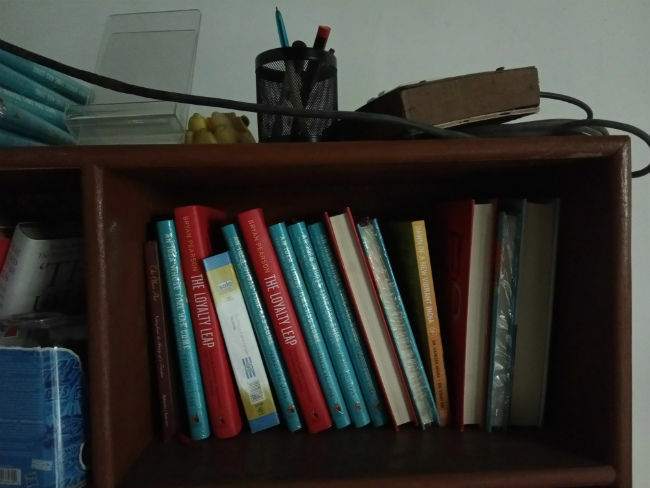 The buttons on the right side are a little rickety and based on user complaints over the years, the buttons on Redmi phones are the first to stop working. The target audience for the smartphone do max out their options for cheap data along with having enough space to store music and videos to watch on the go, which is why there is a dual SIM slot with a dedicated microSD card slot that can expand the storage by up to 256GB. The Xiaomi Redmi 6A also supports dual standby and dual VoLTE which allows users to enable HD calling on both the SIMs and enjoy internet data from both the SIM cards. The Xiaomi Redmi 6A is also quite handy to use. If you’re used to travelling in crowded buses and metros, the phone will be easier to use in such situations. The curved edges render a good grip and even with a taller display, it’s easy to use one handed. Note that there is no fingerprint sensor on the phone. The Redmi 6A relies on face unlock and traditional PIN-based unlock. The Xiaomi Redmi 6A touts a 5.45-inch IPS LCD display with a 720x1440 pixel resolution. It’s in the newer 18:9 display format and that provides a lot more screen real estate. The math indicates there’s only 295 pixels per density. The phone compensates that with added brightness which makes the panel sufficiently legible while indoors. 720p content also look pretty sharp and but out in the open sky, the colours look visibly washed out. The content also adapts to the taller display. YouTube videos can be stretched to fill the screen but it also crops out a part of the video. It’s a functional display at best, and at its price, the extra real estate is more than welcome. 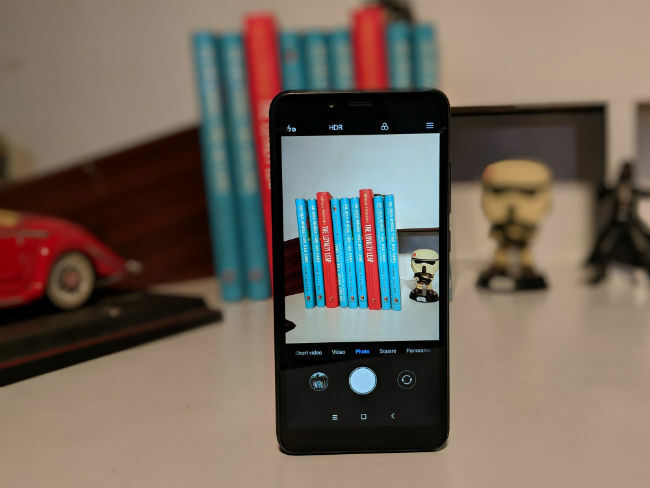 The Xiaomi Redmi 6A ushers a new era of Xiaomi phones in India. It’s the first of the two devices in the new lineup to feature a MediaTek chipset. The Redmi 6A is powered by the new MediaTek Helio A22 SoC. It’s a 12nm quad-core chipset with two performance cores clocked at 2.0GHz. Like the Snapdragon 425 used on the Redmi 5A last year, this also relies on the Cortex A53 cores. And being made on a 12nm process, it’s also more efficient than the 28nm-based Snapdragon 425. 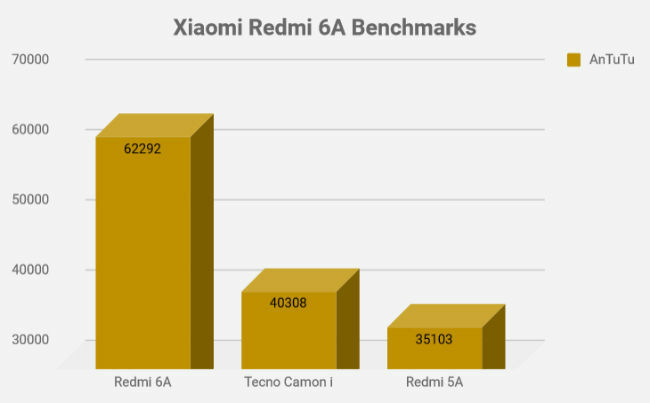 The benchmark results easily peg the Redmi 6A as visibly more powerful. AnTuTu 7.06 gives a score of 62292 while on 3DMark Slingshot the entry-level phone scores 451 indicating it’s not a good device for playing games. 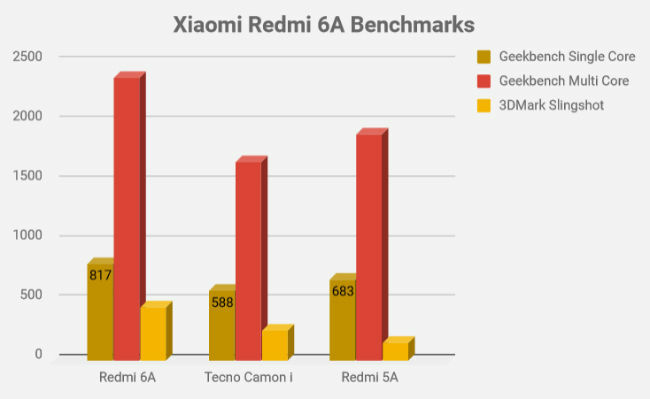 On Geekbench Single Core and Multi Core tests, the Redmi 6A scores 817 and 2376, both higher than last year’s Redmi 5A. But while the chipset is perfectly capable of handling day to day tasks, the bottleneck is in the RAM. You get 2GB of RAM as compared to 3GB in the Redmi 5A. It's not adequate enough to allow multi-tasking and the experience of using the phone is actually quite sluggish. Add to that 16GB on board and you suddenly see Xiaomi walking backwards. You only get around 10GB worth of storage which will get easily filled up in a few months of usage. The higher variant does offer 32GB storage on board and if you're planning to get this device, I'd recommend to go for this one. You'll still be stuck with inadequate RAM though. The Xiaomi Redmi 6A runs on MIUI 9.6 based on Android 8.1 Oreo. Options like picture-in-picture and improved notifications are what you'll get over its predecessor. But the experience won't be as satisfactory though. If you have even two-three apps open in the background, you'll see noticeable lags in operating the phone. Apps like the Dialer takes a good ten seconds to launch. The Xiaomi Redmi 6A sports a 13MP camera at the back and a 5MP camera up front. Even for a entry-level device, the quality of photos seems good enough when there’s ample light. It’s low on dynamic range and colours get lost in the shadows, but it shoots well exposed photos otherwise. The camera app is a bit sluggish though. It takes some time to focus and there’s a noticeable lag after you’ve shot the photo. 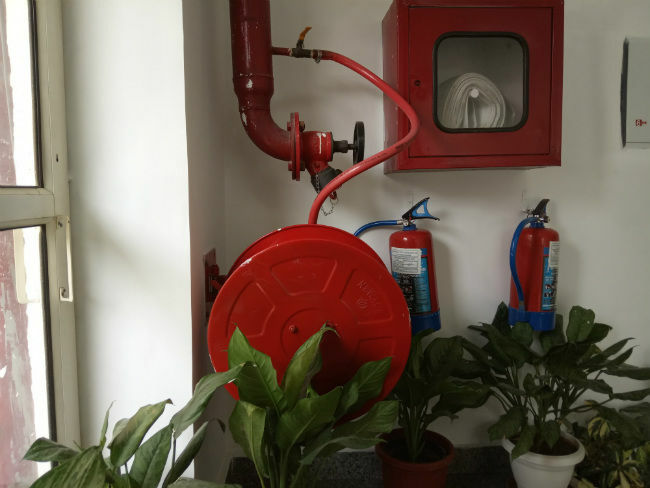 The camera algorithms work to enhance the saturation and contrast and that results in eye-pleasing shots indoors. Under low-light though, there is ample amount of noise with little detail reproduction. That’s understandable considering the price of the phone. The front camera is also quite capable of taking good selfies, although if you’re taking it against a strong source of light, the face gets silhouetted. The Xiaomi Redmi 6A is powered by a 3,000mAh battery. It's perfectly sufficient to last more than a day. On the PCMark Work 2.0 test, we got around 8 hours of screen on time that should easily convert to around one and a half days of usage. 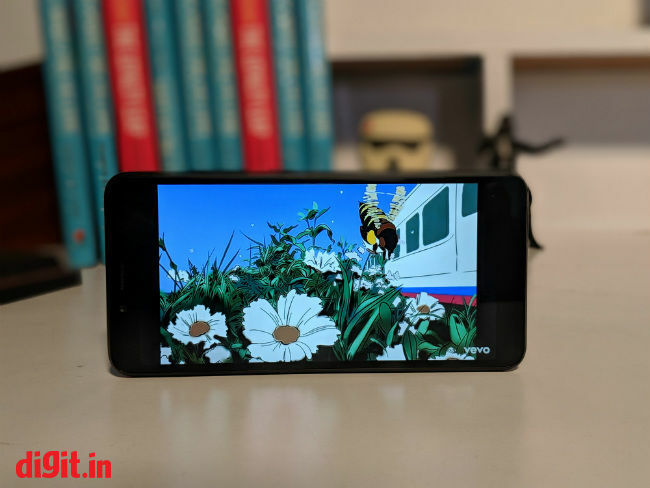 I believe it’s the efficiency of the 12nm chipset that does the trick and a smaller display with lower resolution also helps in saving power. The Xiaomi Redmi 6A doesn’t support fast charging though and it takes a good two hours to top up the device.